Plus, buy 1 get 1 free storewide. All offers are subject to availability. Selection varies by store and online. Offers valid on new purchases only and may not be combined with other promotional offers or discounts. 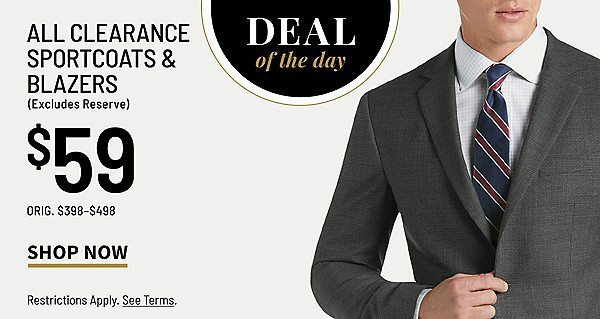 Discounts may not be applied to tuxedo rentals or the fees and taxes associated thereto, alterations or toward the purchase of gift cards. 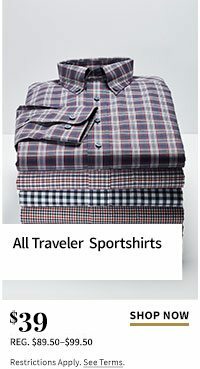 Additional charges may apply for Big & Tall sizes. Advertised prices do not include accessories shown. 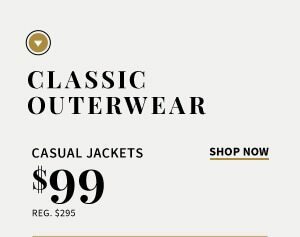 Offers not applicable at Factory Outlet stores. Free shipping on $50 or more applies to all US online orders. Customers returning items purchased with a coupon or other discount will give up the portion of the discount used for those items; coupons cannot be redeemed for cash or credit. The Jos. A. Bank return policy will apply to the remainder of the purchase. Loyalty program points are earned only on amounts expended by you in connection with the purchase and are deducted for any returns. 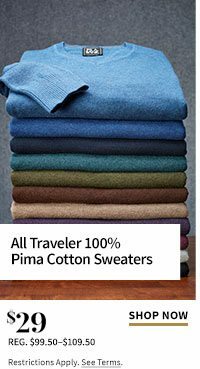 $299 All Traveler Suits, $199 Traveler Sportcoats, $39 All Traveler Sportshirts and $29 All Traveler Pima Cotton Sweaters: Additional charge may apply for Big & Tall sizes. Cannot be combined with other promotions. 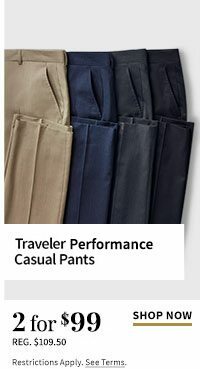 2/$99 All Traveler Performance Casual Pants: Excludes custom clothing. Must purchase 2 items to receive discount. Additional charge may apply for Big & Tall sizes. Cannot be combined with other promotions. 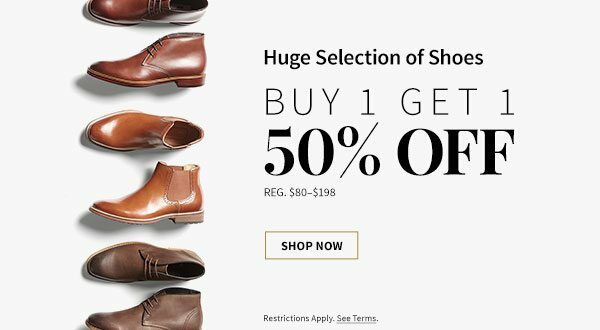 Buy 1 Get 1 50% Off Huge Selection of Shoes: Buy one item at regular price and get one like item of equal or lesser value at 50% Off regular price. Excludes clearance. 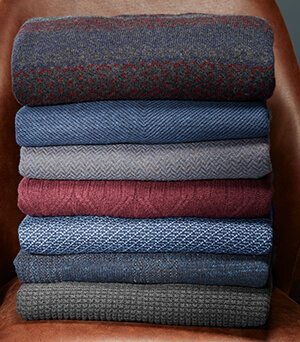 Buy 1 Get 1 Free: Select styles only. 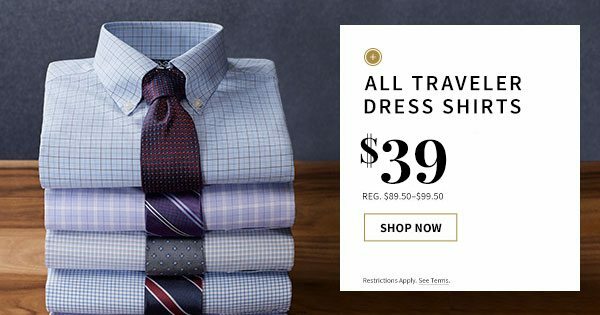 Excludes Custom, Suits, Separates Packages, gift cards and clearance. Purchased item must be at regular price. Free item must be like purchased item and of equal or lesser value. 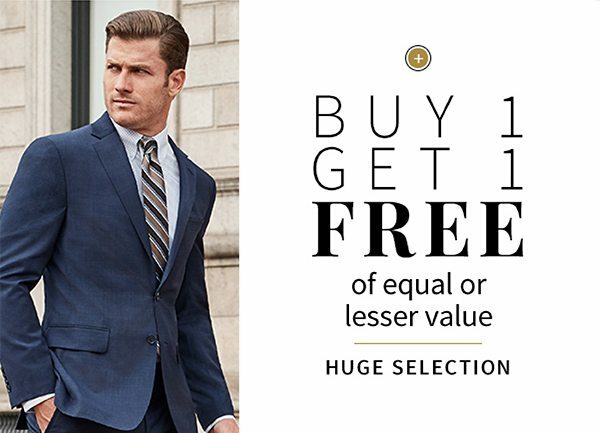 Buy 1 Get 1 Free Suits and Separates Packages: Buy one Suit or Separates Package, get one Suit or Separates Package free. Select styles only. 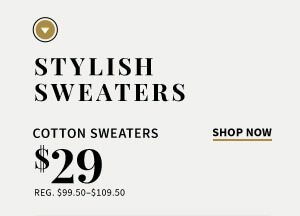 Excludes Custom, gift cards and clearance. Purchased item must be at regular price. Free item must be of equal or lesser value. 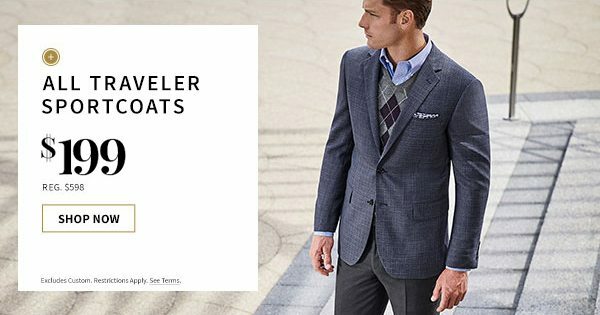 Separates Package must include jacket. 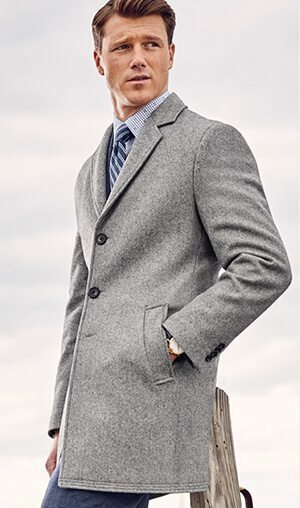 End of Season Savings Up to 75% Off Outerwear & Sweaters: Select styles only. Excludes custom clothing. Discount taken off regular price. Cannot be combined with other promotional offers or discounts. Excludes clearance items. Please do not reply to this email. Contact us using our online form. To ensure our emails arrive in your inbox, please add josabank@shop.josbank.com to your address book. © 2019 Jos. 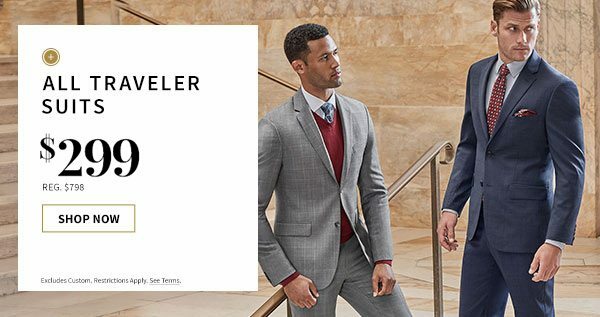 A Bank Clothiers. All rights reserved.